I started my internship at FSU’s Small Craft Advisory Press (S.C.A.P.) only about a week ago and I have learned so much about the production process in a printing press already. 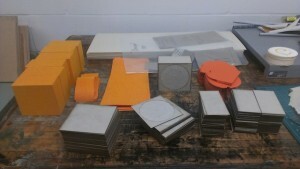 Right now my tasks surround the completion of an on-going project Cropwork Orange; a collaboration between Robert Fichter, Bea Nettles, and our own printmaking faculty Denise Bookwalter. When completed the books will be in an edition of 50. Many materials are being used for these books as they are designed in an unorthodox manner that pushes the understanding of a book as an object. Most of my time so far has been spent laser cutting the enclosure box parts and preparing them for assembly. This included laser engraving the colophon and artist names on certain pieces of the enclosure, sanding scorch marks off the wooden parts, cutting pieces out of binder’s board for the cover’s inset, and prep the paper envelopes. When working in production I have noticed that it does not hurt to make extras just in case some thing goes horribly awry. We have to cut extra basswood pieces because many have been damaged due to warping or price tag sticker residue. I am learning that there are many tasks at hand to keep a press working smoothly, and that even simple responsibilities like keeping lead type and other letter press objects organized contribute to making the production process smoothly. Especially when dealing with papers and textiles it is important to keep a clean working environment so materials are not accidentally damaged. I have also learned that although one project may be the brainchild of one or a couple artists there are sometimes many more hands that have worked on the single idea behind the scenes. 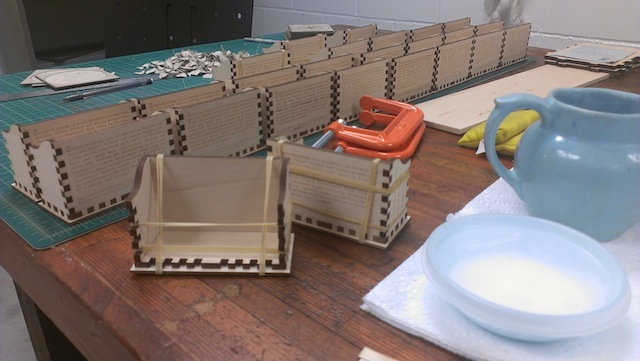 As with my role in the project I am doing simple prep work to ensure superior craftsmanship of the final edition. Once I am finished with my internship I hope to have learned specifically how to use a letterpress and to make sense of that entire process (because it seems really intimidating and terrifying) and be familiar with the Rhino software. It goes without saying that my internship experience was to gain experience in an active print “shop”.